The Christmas tree at dusk. No guests yet. 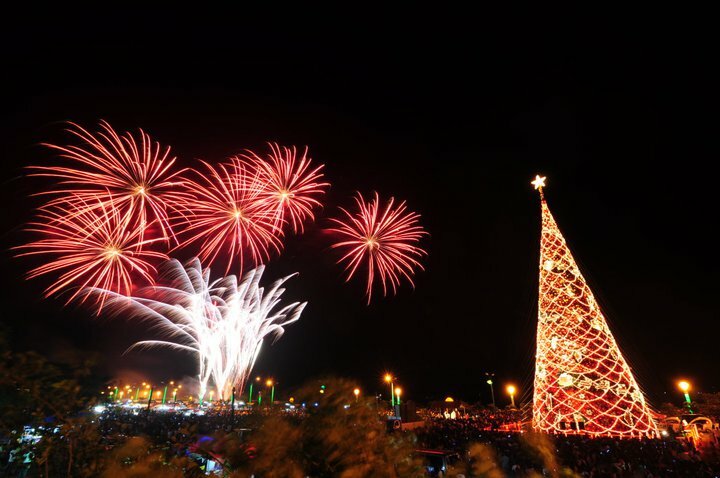 ﻿﻿Every year, Mayor Edward Hagedorn,Vice-Mayor Bayron, and PPC City Council host a tree lighting Ceremony at the public park at the Baywalk on Puerto Princesa bay. This event is the begininng of a jolly time in Puerto Princesa. Even the Palawan Government Capitol Building area is decorated in Christmas attire with food and vendor stand during the day and open till late in the evenings. 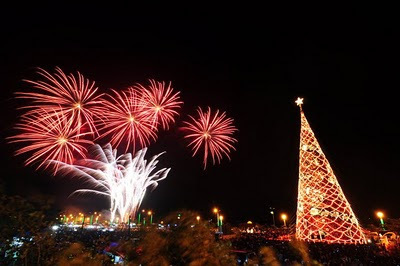 Puerto Princesa City celebrates its Fiesta on the 8th December, the Feast of the Immaculate Conception of Mary. Fiesta activities begin during the first week of December with the series of religious activities. 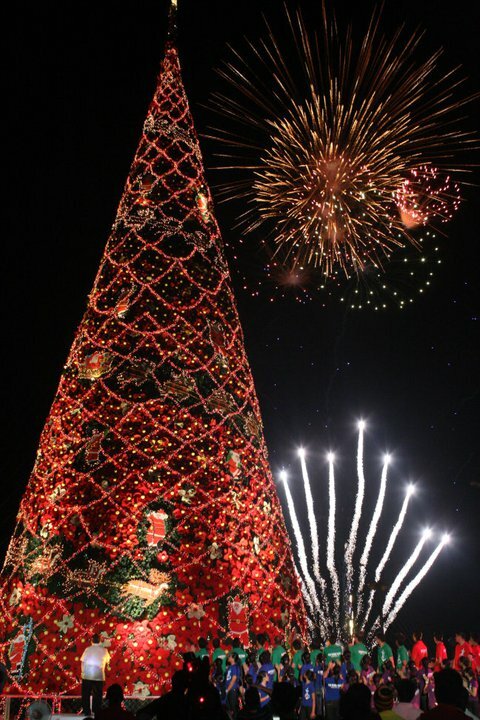 The celebrations extends towards the Christmas season laced with nightly cultural presentation, yuletide activities topped by the lighting of the giant Christmas tree and fireworks, as well as ago-industrial, tourism and food fairs. The combined month-long activity is dubbed as "Pista Na, Pasko Pa". One of the many school or Church choirs for entertainment. The last song is sung by a very loved Mayor Ed with his wife and helpmate Ellen Hagedorn, or Mam Ellen, as best she's know to the locals. The Mayor has a deep raspy but smooth, country westernish voice. At the end, the long time power couple sing in duet. Clap, clap, clap, clap! The Hagedorn Power Couple singing a duet before the tree is lit. While they are singing, the lights on the tree illuminate the massive handmade ornaments to reveal a giant Santa on a sleigh with reindeer, fireworks exploding in founts and expanding bursts behind it! Each ornament is wrought by the hands of local talent that Ellen Hagedorn has nurtured into a trade. For two years I've seen the various phases of the trees' construction. I've watched her people sew the individual flowers, create Santa et al made of Styrofoam, each hand painted. There must be a thousand at least. (NOTE to self: Get figures from Mrs. Hagedorn), They cut out and re-use buntings, as well as what they can from previous street decorations and last years ornaments. Many times the wind rips through the tree damaging the decorations. It's truly a work of love by Mrs. Hagedorn and her team. The entire Baywalk Park was covered in a sea of people. Even the road up the hill overlooking it was clogged by the throngs. It was a beautiful night with twinkling stars out. Only gentle clouds breezed past overhead to give a reminder to be grateful for what could be. Mayor Ed ended the ceremony with a touching speech of gratitude to the people for all their support in the previous election. This is his last legal term and he's determined to continue leave lasting positive legacies to the environment and it's people. He then endowed 50,000. PhP to each participating choir on behalf of the City Government of Puerto Princesa. Puerto Princesa Christmas Tree celebration Dec. 1, 2010 by Bob Ocampo. The man far left in white barong is none other than Mayor Edward Hagedorn. This gives the scale of the tree! Bob, Many thanks for the use of your photo. Photo by Wine Orlido - Many thanks for the use of your photo!